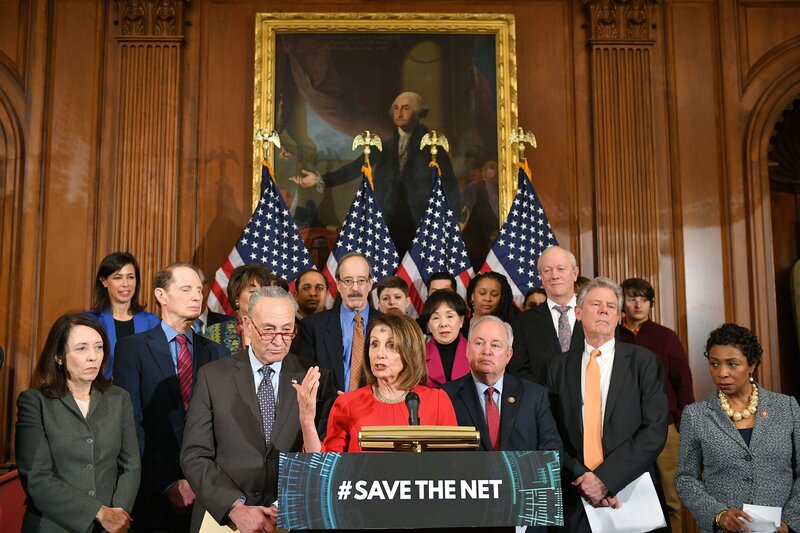 A major piece of net neutrality legislation, titled the “Save The Internet Act,” has officially passed in the House of Representatives, reports The Hill. The act would restore Obama-era net neutrality rules from 2015, which gave the Federal Communications Commission (FCC) the power to protect internet users and stop internet giants like AT&T or Comcast from making high-speed internet exclusive and expensive, and deciding which online content gets prioritized. If you need a quick refresher on net neutrality, read ours here. If, like many people, a fast, accessible and uncensored internet is crucial to your life and livelihood, you should be cheering. The vote is a direct result of the blue wave that reshaped the House of Representatives last year. We know this, because only one Republican voted for the crucial bill (the bill passed 232-190) and, according to Motherboard, the last time a net neutrality bill hit a Republican-controlled house in 2006, it lost by over a hundred votes. Democrats like Congressman Michael Doyle Jr., who introduced the “Save the Internet Act,” are celebrating. Some top employees at the FCC like Commissioner Jessica Rosenworcel (a Democrat) are also celebrating, though others like Chairman Ajit Pai (a Republican), supported the 2017 repeal of net neutrality. The GOP’s main argument against “Save The Internet,” is that its corporate regulation is “heavyhanded,” and represents a “government takeover of the internet,” as Congressman Greg Walden put it. Republicans consistently misinform their constituents, saying the bill could mean future internet taxes, although the Internet Tax Freedom Act of 1998 makes it illegal for federal, state, or local governments to tax the internet access and government taxation is not a possibility. Unfortunately, net neutrality’s popularity likely won’t make a difference where the “Save the Internet Act” is headed next. While passing the House is a huge victory, the bill will now go to the Republican-majority Senate, where Mitch McConnell has promised to sabotage it. Even if the bill miraculously overcomes his threat and mobilizes a bipartisan coalition, the Trump administration has implied it will veto it. This makes sense, given Trump was the one who repealed net neutrality back in 2017. Since then, his administration has spread inaccurate conclusions about the advantages of the repeal, despite the lack of evidence linking the economic gains and technological inventions he cites to the roll-back of net neutrality. If “Save the Internet” dies in the Senate however, according to Motherboard there’s still a chance that net neutrality could be reinstated by way of an ongoing lawsuit against the FCC by a coalition of 23 state attorney generals. We’ll find out the result of that lawsuit in a few months, but either way, if you care about internet access, call your senators and get ready to vote in 2020.